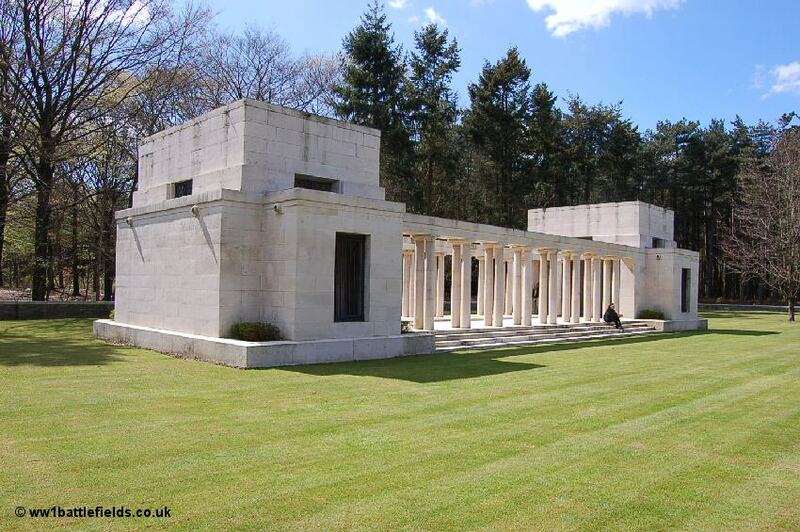 Polygon Wood is a small wood located about four miles east of Ypres. The wood was sometimes known as Racecourse Wood, as there was a track within it. 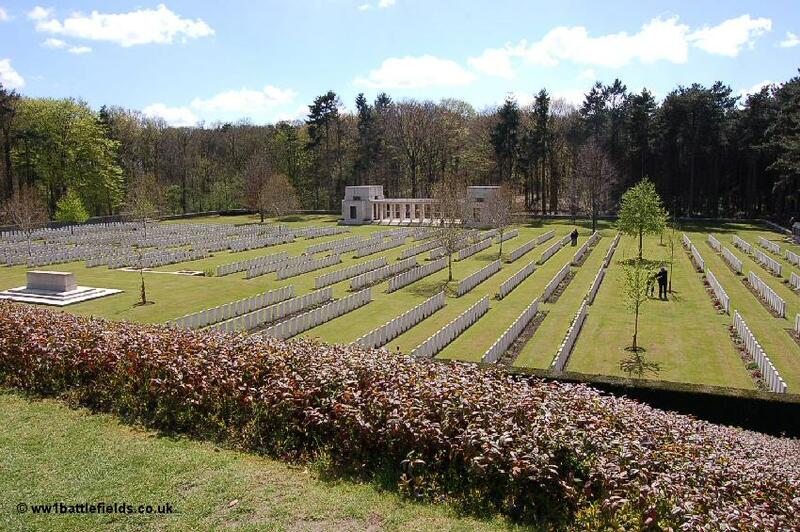 During the Great War, Polygon Wood was totally destroyed, and it was only replanted after the war. There are ‘rides’ or tracks running through the wood (similar to those found in Delville Wood on the Somme). Within the wood is a large war cemetery, a New Zealand Memorial to the Missing and an Australian Memorial. Just outside the wood is a small original wartime cemetery. In fact, the entrances to the both sites are directly opposite on either side of the road (Lange Dreve), at the north-eastern apex of the wood. There is parking for 2-3 cars in front of the cemetery, or it is possible to park on the edge of the wood in various places and follow the ‘rides’ within the wood. 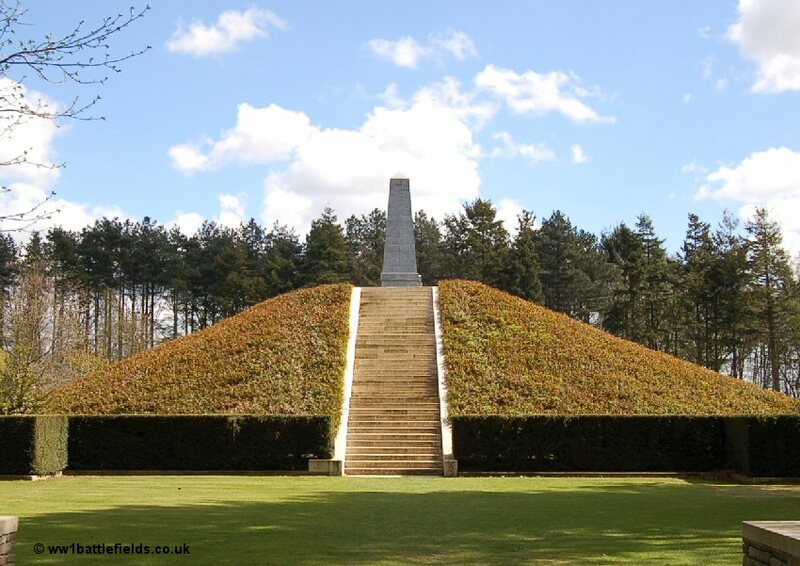 Before the Great War, Polygon Wood was used by the Belgian Army and within it stands a large mound, known as the Butte, which was used for musketry training. Taking the entrance leading into the wood, a grass walkway enclosed by stone walls leads directly to the Butte. There are steps straight ahead leading to the top, where the memorial to the Fifth Australian Division stands. 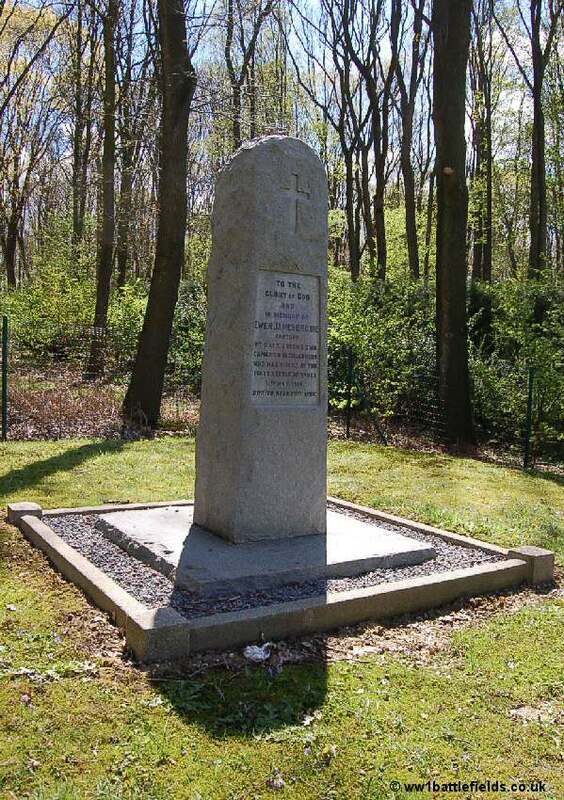 After the War, there were many wooden memorials across France and Flanders, which had been erected during wartime by various units to commemorate those lost in certain actions. However these would not last, and so in April 1919, the Battlefield Exploits Memorials Committee was formed to consider claims made by units which wished to “erect permanent memorials of their exploits”. The Australians did not waste time; after the Armistice they began work to construct their memorials in stone, and these were completed by October 1919 just a month after the deadline for claims to be submitted to the Committee! The memorial here at Polygon Wood is similar to that commemorating the 1st Australian Division at Pozieres on the Somme. It is a tall block constructed obelisk, forty feet high. 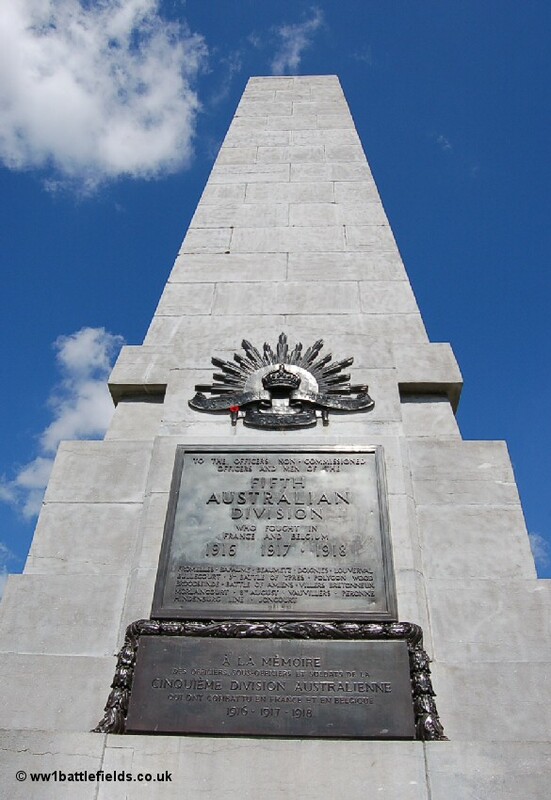 On the front is the rising sun emblem of the Australian Imperial Force, and underneath a large plaque which reads ‘To the Officers Non-Commissioned Officers and Men of the Fifth Australian Division who fought in France and Belgium 1916 – 1917 – 1918.’ Beneath these words is a list of their battles, which include Polygon Wood. 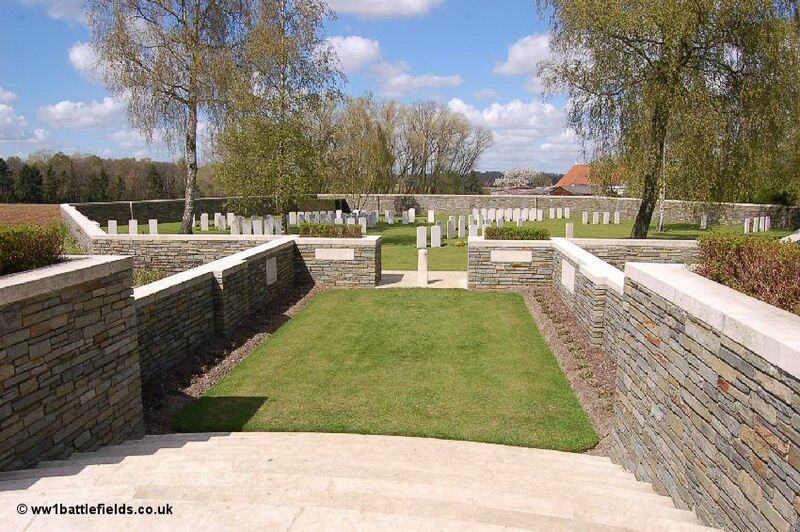 Because of its imposing position there are excellent views from the Butte of Buttes New British Cemetery. The cemetery is fairly large, and was made after the Armistice. The bodies of many of the soldiers buried here were therefore recovered quite some time after they had died. This explains why of 2,109 burials here, only 433 are identified. Over three-quarters of the burials are unknown – men ‘Known Unto God’. Most of those buried here died in 1917. The New Zealand Memorial to the Missing is located at the far side of the cemetery. 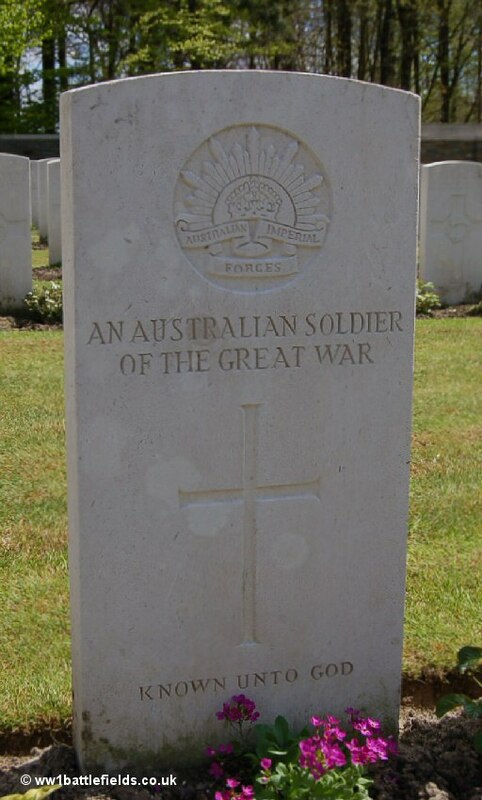 It is one of seven which are located in cemeteries close to locations where the New Zealanders fought (for instance at Messines). This one records the names of those from New Zealand ‘who fell in the Polygon Wood Sector September 1917 to May 1918 and whose graves are known only to God’. It is a large and impressive structure, and 378 men are named on the memorial, from several New Zealand Battalions. The ‘window spaces’ in the front of the memorial are barred and provide an interesting aspect to look out at the cemetery and the Australian Memorial. 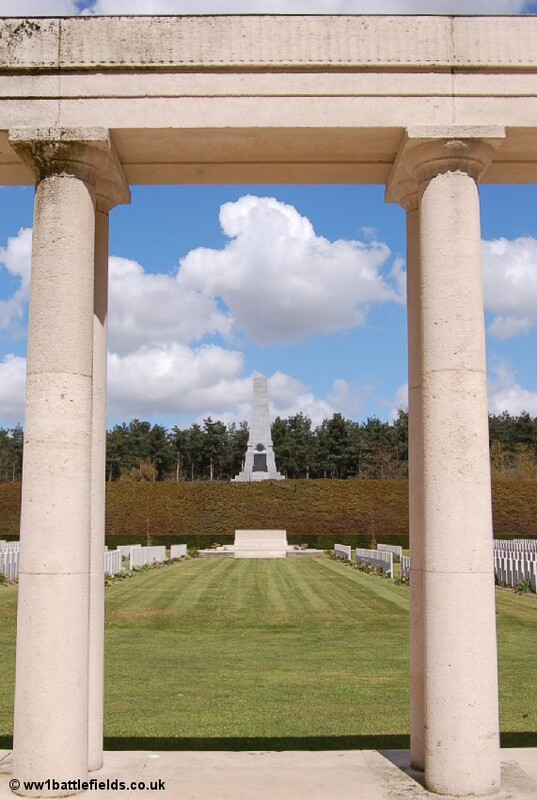 Polygon Wood was the scene of fighting early on in the Great War, during the First Battle of Ypres in 1914. On the 25th of October 1914 the Germans held the northern half of the wood, and 1st Irish Guards and 2nd Grenadier Guards were ordered to clear them out. During their advance here, nine of the Irish Guards were killed and four wounded by a single shell. The scene was described as “a slaughter-house”. During the early hours of the next day, the two battalions, reinforced by the 3rd Coldstream Guards, attacked again. At some point during these actions, the medical officer serving with the 1st Irish Guards, Lieutenant Hugh Shields, was killed whilst trying to tend the wounded. This happened just after he had been warned about the dangers he faced in being exposed to enemy fire. He has no known grave, and is commemorated on the Menin Gate. 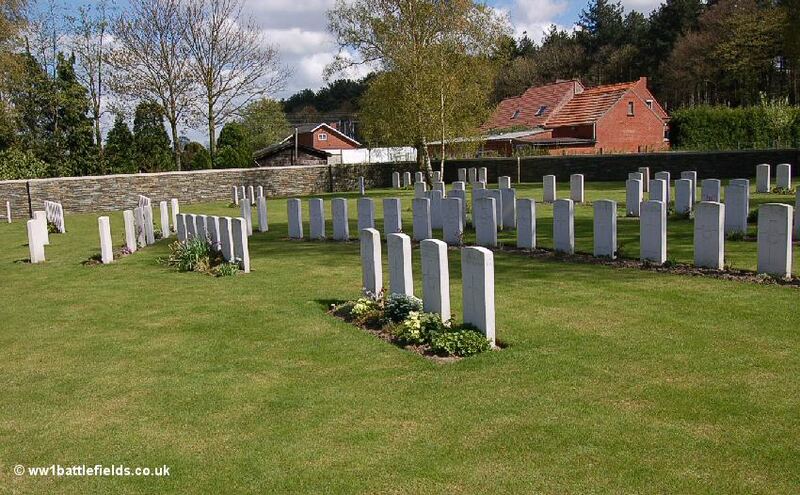 Unusually, the CWGC website gives the date of death as “between 25/10/1914 and 26/10/1914”. The wood was lost to the Germans in May 1915, but in 1917 (Third Ypres) it was taken again. On the 20th of September 1917, the 1st Australian Division attacked, taking Glencorse Wood (see below) with little difficulty, and the 12th Battalion reached the west side of Polygon Wood at 7.45 a.m., just two hours after the attack had started. On the 26th of September, the battle for the wood itself commenced. This time it was the 5th Australian Division on the attack, and the 15th Brigade were initially held up by pill boxes at the south-west corner of the wood but advanced on to the position of the racecourse (to the south-west of where the cemetery stands today). The 14th Brigade reached and captured the Butte, and that is where the memorial to the 5th Australian Division stands today. After it had been taken, the wood was bombarded by the Germans in autumn 1917, with gas shells as well as shrapnel. Months later, on the first warm day in the spring of 1918 it was reported that there were many casualties from gas, as the gas in the shells which had lain there was warmed by the sun and the poisonous vapours released. This small original wartime cemetery is outside the wood, reached by the entrance opposite that to Buttes Cemetery. 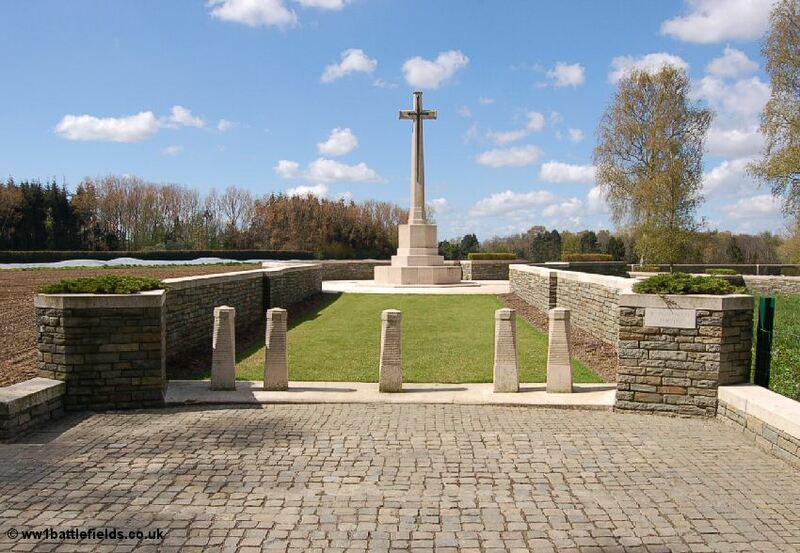 The entrance path from the road leads to a circular area where the Cross of Sacrifice is located, then, at an angle, steps lead down to the cemetery itself. There are special memorials by the front wall to three men known to be buried here. 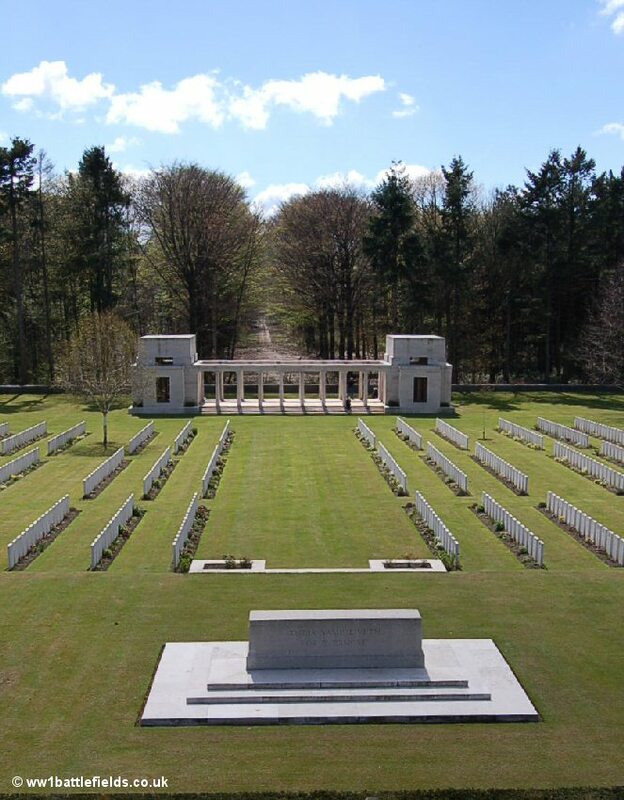 The irregular layout of graves indicates the nature of the cemetery – as compared to the much more regular and formal layout of post-Armistice ‘concentration’ cemeteries such as Buttes cemetery within the wood. There are just 107 men buried here, 89 of whom are identified. Many did in the winter of 1917/18. This is a quiet and peaceful cemetery, although there are houses nearby. There was at one time a German cemetery adjoining the British one, but those graves are long since removed, although one German soldier is buried within the cemetery. Glencorse Wood is located just a little to the southwest of Polygon Wood. 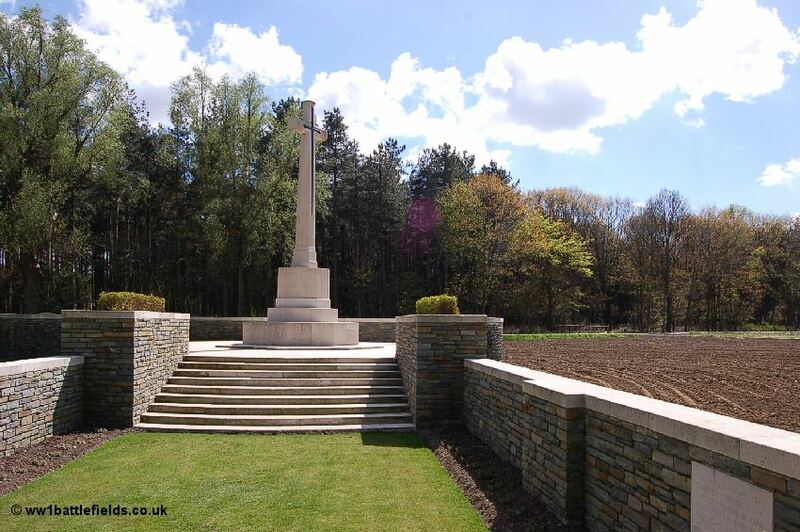 However it is on the other side of the A19 motorway, and is best reached by following the small road (Oude Kortrijkstraat) which runs to the south of Polygon Wood back in the direction of Ypres. At the junction with a road called Wulverstraat, just to the south of the wood, is an orientation panel which gives some information on the wood. It explains that Glencorse Wood was the name given to the southern part of the wood which surrounded the Benedictine Abbey which used to stand near here. The other part of these woods was known as Nonnebossen. 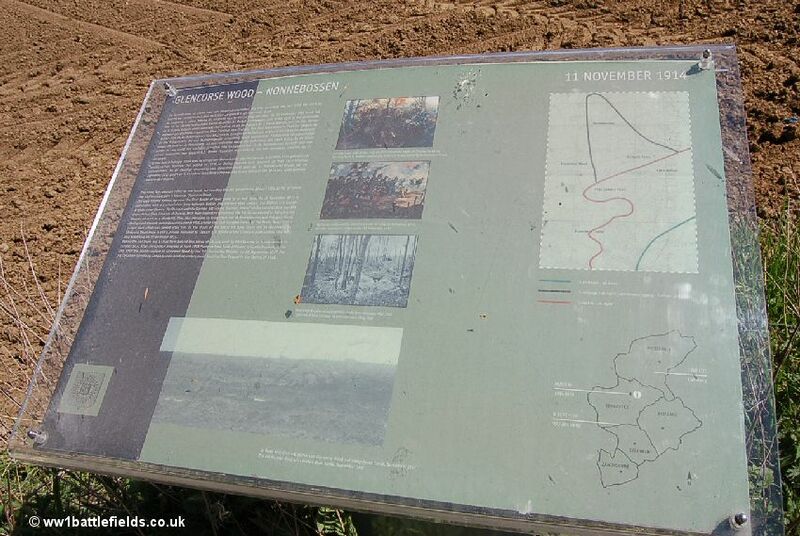 Glencorse Wood was where the First Battle of Ypres ended, on the 11th of November 1914. 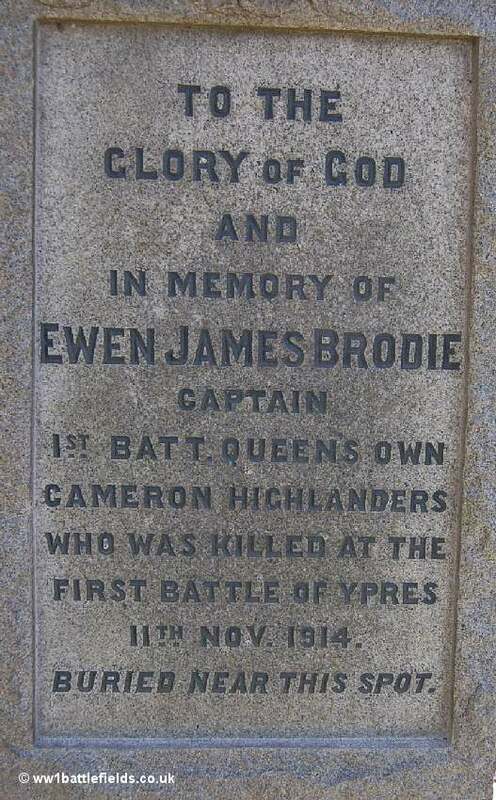 Captain Ewen Brodie of the 1st Queen’s Own Cameron Highlanders was one of those killed that day, and a private memorial to him can still be seen today in Glencorse Wood. To reach this, go north from the panel, and up a tiny track which leads into the wood. The memorial is to the right just before the road dips down towards a farm. The memorial is today surrounded by modern log cabins. It takes the form of an upright stone, with a cross carved on it and an inscription stating that the memorial stands near where Brodie was believed to have been buried. However, his body was never found. As he has no known grave, Brodie is commemorated on the Menin Gate in Ypres. 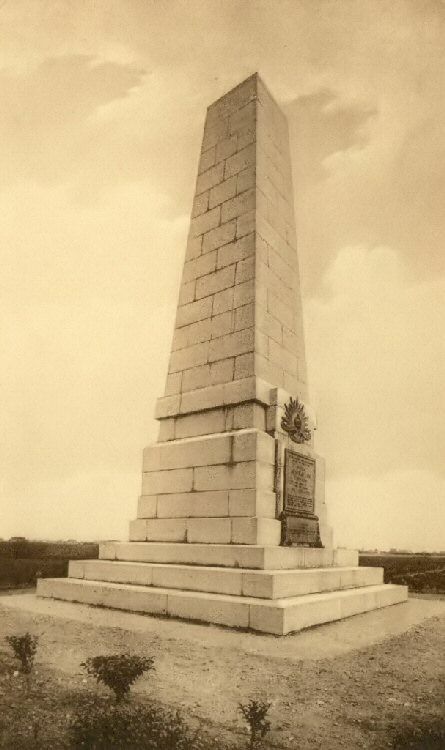 The land the memorial stands on was purchased after the war by Ewen Brodie’s mother, and the memorial erected in 1923. A small garden once surrounded it. It is now cared for by the CWGC. 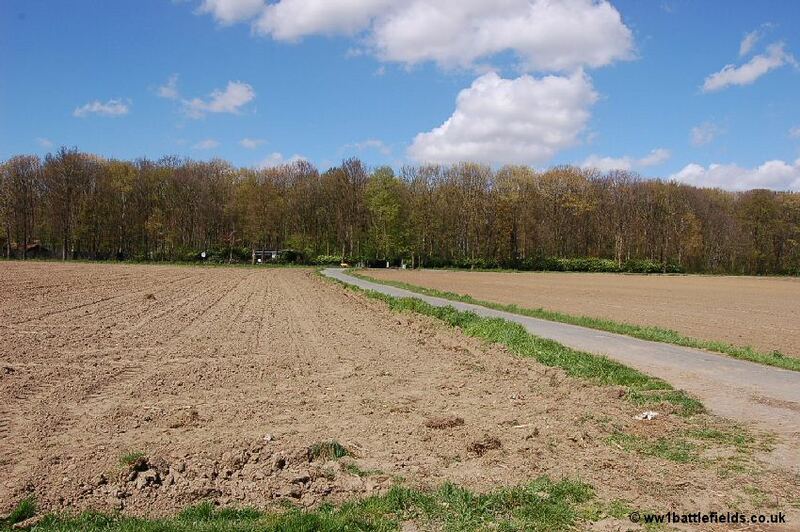 Glencorse Wood was also the scene of fighting during Third Ypres in 1917. The 7th Bedfords stormed the wood on the 10th of August, but the ground was very marshy and it was difficult to consolidate.The 6th Northamptonshires were also involved, when two Lewis gunners rushed an enemy dugout just to the south of the wood, capturing forty of the enemy.